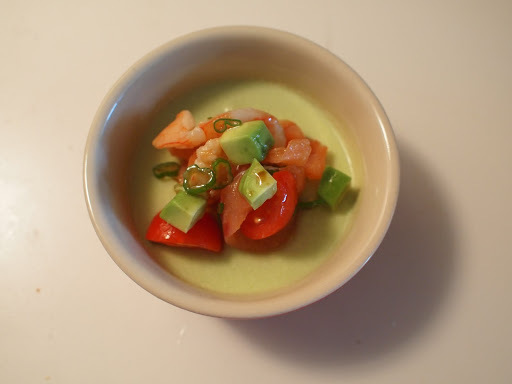 The avocado panna cotta is garnished with smoked salmon, poached shrimp, cherry tomatoes, avocado and scallion dressed in a lime soy sauce vinaigrette. I wanted to make the avocado panna cotta with bonito broth because just using heavy cream would overpower the taste of the avocado and make it too rich. I find that the bonito broth is a better choice than chicken stock not only because it is lighter but because I find that avocado pairs well with seafood. I guess the soy sauce vinaigrette comes from my background. I added the lime instead of vinegar to achieve a more refreshing vinaigrette. *Make the bonito broth with the instant bonito broth powder (dashi)- follow instructions on the box/jar. 1. Bloom the gelatin sheets in a small bowl of cold water until slippery and soft. 2. Heat the bonito broth and heavy cream on low heat (do not boil) in a medium sauce pot and season with salt. Taste and add more salt if needed. 3. Meanwhile, fabricate the avocados by making a cut lengthwise through the middle, twisting the two halves away from each other, and removing the seed. Scoop the flesh away from the skin and squeeze some lime juice over. 4. Puree the avocado through a tammy sieve. 5. When the gelatin sheets have bloomed, squeeze the excess water and place in a large bowl. 6. When the bonito broth heavy cream mixture is hot, add enough of it to the avocado puree to end up with 6 cups total (there will be come leftover bonito broth and heavy cream). Mix well. 7. Add the mixture (still hot) to the gelatin sheets and mix well. 8. Pour ½ cup of the mixture into 12 ramekins or container of choice. 9. Leave to set a little in room temperature then place in the fridge to set (4-5 hours or overnight). 10. Once the avocado panna cotta has set: Cut the peeled and deveined shrimp in half lengthwise. 11. Heat the bonito broth over low-medium heat in a small sauce pot and poach the shrimp until just cooked. The bonito broth should be steaming but not simmering. 12. Remove and leave to cool in a medium bowl. 13. Add the thinly sliced smoked salmon, thinly sliced scallion, quartered cherry tomatoes and diced avocado to the bowl.